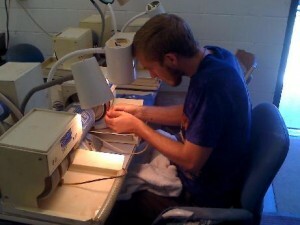 RAGMS members have access to use the lapidary workshop where they take rough mineral specimens and work them with several kinds of equipment to create display pieces, sculptures and jewelry. Open Monday – Saturday – 10:00 a.m.-3:00 p.m. and Wednesday evenings, 5:00 p.m.-9:00 p.m. Wednesday evenings we are not able to accept cash, so please bring checks only. We have over a dozen saws for rock cutting and 4 more smaller saws for slab trimming that can be used by members for a modest fee. Each saw has a blade with diamond dust in it to cut through the stones. Our biggest saw has a 36 inch blade and is capable of cutting an 18 inch rock. Our smallest saw is for cutting small thin slabs of stone and its blade is only 6 inches. We start by cutting a large rock into thin slabs. These slabs are then cut by a smaller saw where it is trimmed to size. This shape cam be just about anything, or just a free-form shape that compliments the beauty of the stone. 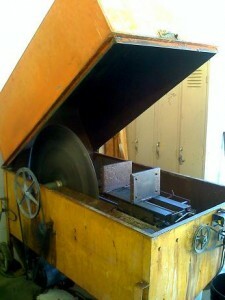 From there, they are taken to the grinding wheels (Genies) where they are shaped and polished. the workshop has quite a selection of mineral for sale to the public. As a membership benefit, RAGMS members get discounts on certain materials. Tons of rough rock is available. Choose from petrified wood, agate, jasper, obsidian, and thundereggs. Much of this material is also available as slabs in the workshop..
We have lapidary supplies available for sale, including grits, oils, polishing media and more. If you want new equipment, we can order it for you at cost +10% + shipping. We often have used equipment available for sale. If you’re interested in selling your equipment, we may be able to assist on a consignment basis. Contact the workshop manager for more information.